Rabat (VNA) – National Assembly Chairwoman Nguyen Thi Kim Ngan received President of the Morocco-Vietnam Friendship Association Elktiki Mustapha in Rabat on March 28 afternoon (local time), during which she affirmed that bilateral people-to-people exchange is an important diplomatic channel. Ngan shared that her visit aims to boost and deepen friendship and multifaceted cooperation between the two countries in general and between the Vietnamese NA and the Moroccan House of Representatives in particular. Elktiki Mustapha, in turn, stressed the significance of the Vietnamese top legislator’s official visit as it took place on the occasion of the 58th anniversary of diplomatic ties. He said that his association was set up right after the official visit to Vietnam by Speaker of the Moroccan House of Representatives Habib El Malki in late 2017. It has established ties with the Vietnam War Veterans’ Association. He expressed his hope that Vietnam soon establishes a Vietnam-Morocco Friendship Association, so that the two associations can intensify cooperation for better mutual understanding between the two peoples. 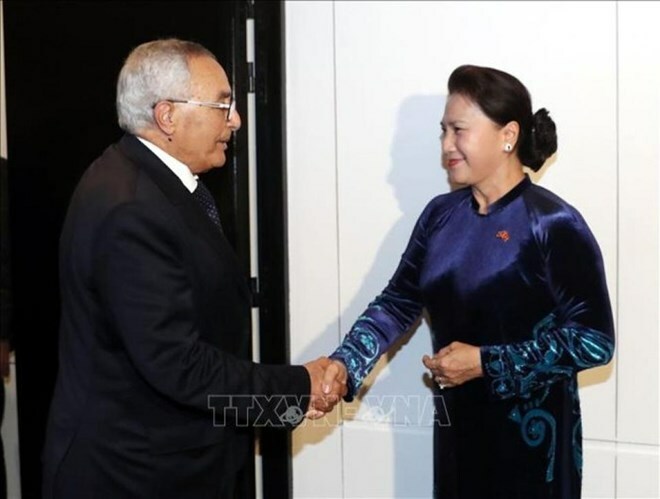 He told Ngan that his association is compiling a book highlighting similarities of Morocco and Vietnam to help Moroccan youths understand more about the two countries’ histories. He said he is delighted when hearing that the Vietnam War Veterans’ Association has a similar intention. Mustapha affirmed that his association’s members will do their utmost to further develop the bilateral relations. The top Vietnamese legislator affirmed she will work to speed up the establishment of the Vietnam-Morocco Friendship Association after returning home.